At Eco Dwelling, shoppers discover unique gifts and distinctive home goods that can be characterized by all of the latest buzz words – sustainable, organic, recycled, eco-friendly and vintage. But for owner and interior designer Angie Besecker ’89, being “eco-logical” is something that took root during her college days. Angie, who graduated with a bachelor’s degree in management and a minor in marketing from the Bryan School of Business and Economics, purchased an indoor/outdoor advertising display company, which she grew from seven locations to 80, and from that built a full-service advertising agency, Luna Blue Creative . 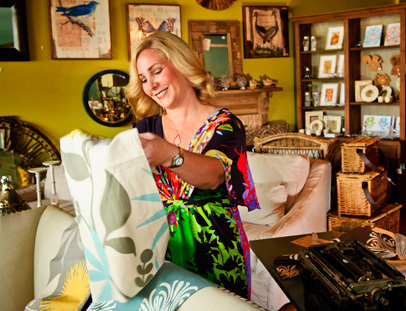 Angie opened her first retail home store, Dwelling, in Summerfield and featured furniture, lighting, mirrors, art, fabric and gifts. “I met so many wonderful artists – socially responsible designers and manufacturers who were creating unique eco-friendly products.” Glasses made from wine bottles, dining tables from reclaimed elm wood, serving bowls from old Beatles records, and lighting from French wine barrels to name a few. I just asked myself, what’s missing in this area? Definitely an eco home store. In the new Greensboro location on Lawndale Avenue, the footprint is substantially larger and the name has been changed. “Eco Dwelling” underscores Angie’s commitment to sustainable and eco-friendly materials, such as reclaimed wood, metal, hemp and bamboo. Angie is passionate about partnering with local and socially responsible businesses. “We design furniture that gets built in the Triad by experienced carpenters and upholsterers whose jobs are overseas now.”And she hopes to continue her popular farmer’s markets, which feature organic wine tastings and locally-made, organic bread, honey, jams, fresh eggs and more. With a knack for helping her clients envision and personalize their living spaces, Angie has a sustainable approach to home design as well. “I encourage smart purchases that can move with you when you change houses or that can find a new purpose in your home.” She shows clients how to get the most out of the furniture they already have.